The Ford 2003-2007 6.0L Power Stroke stock variable geometry turbocharger (VGT) has two deficiencies: variable vanes prone to sticking causing poor response and lack of performance when adding electronic modules. You can purchase one of our exchange stock units that our turbo rebuild division has redesigned which does eliminate most of the sticky vane situations (exchange units on the shelf, ready to ship), but, what about when you want the extra response after adding a performance module? The old standard non-variable geometry turbochargers installed on a 6.0L Power Stroke can it give extra the mid-range to top end performance, but low engine rpm turbo-lag and high altitude operation will not be satisfactory. We learned that lesson all too well… But, unlike many others, we have learned from this and we have designed new a new technology. BD’s exclusive design TURBINE DIVERTER VALVE provides good low engine rpm turbo response right through to peak operating rpm. With reliable and rebuild able features. Upon deceleration, the turbo exhaust gas drive pressures are reduced, resulting in reduced turbo rpm and boost pressures. When throttle is reapplied, turbo drive pressure has to be built up, and the result is turbo lag or that ‘fall on your face’ feeling. The turbine diverter valve directs exhaust gases into one volute of the turbine housing to achieve enough drive pressure to accelerate the turbo. By utilizing only one volute, less volume of exhaust gas is required to build drive pressure in the single volute passage of the turbine housing; therefore, the turbine wheel assembly rpm increases quicker which reduces turbo lag, faster spool up and acceleration. Once optimal boost pressure is achieved, the second volute in the turbine housing opens up for full power and less turbine restriction. 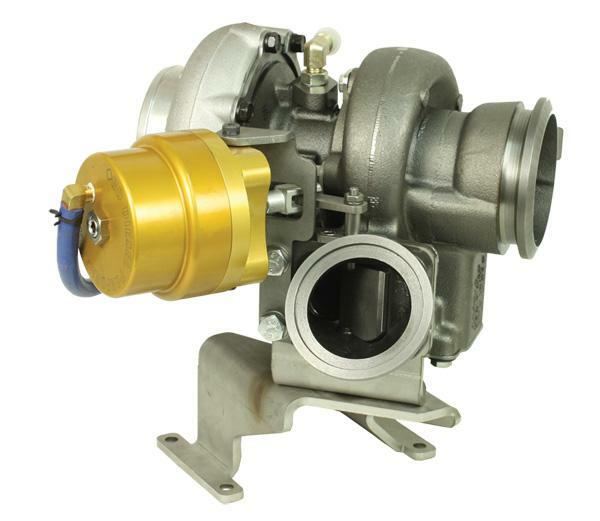 Dual volute turbine housings allow the diverter valve to utilize just one or both of the volutes to maintain turbo pressure at different engine RPM’s. The turbine diverter valve is controlled by boost pressure for precise performance. A custom BorgWarner S300 turbocharger that has extended tip technology, double-port adjustable waste gate and shrouded housing, and, can support airflow requirements all the way to 450 rear wheel horsepower, yet maintains drive ability on the street. Designed as a direct, bolt-in replacement for the stock turbo, the Turbo Thruster II kit includes everything needed for a professional-quality installation.